I was recently contacted by Crock-Pot as they wanted to tell me about something they are calling Crocktober. 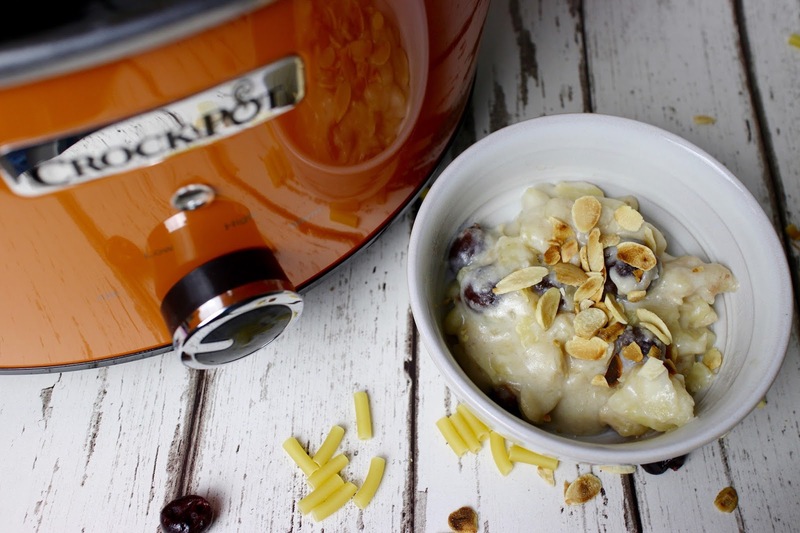 Rather than all of those October events that try to make you give up on things, Crocktober encourages you to break out the Crock-Pot and celebrate all those dishes that are cooked low and slow. As part of Crocktober, I was asked to post about my favourite slow cooker recipe. This is an almost impossible thing for me; I love and cook so much in my slow cooker! However, when I sat down to think about it I knew that my favourite recipe would have to be an adaptation of one of my mum’s recipes. Food is a big part of my childhood memories and whenever I eat something that reminds me of my childhood it makes me feel all warm and fuzzy inside. So, I decided to take my mum’s sweet macaroni recipe and give it a punch of extra flavour. Do not adjust your TV sets, you did hear me correctly! I said SWEET MACARONI. Crazy, huh? I didn’t think it was anything unusual until I started to talk to other foodies about it and they all thought I was completely crazy! It is really delicious though, so you should definitely try it. I’ve given this an injection of flavour I don’t think my Mum would really approve of, but then I’m a big boy now and I can do what I like with my recipes! (Only joking, I still do as I’m told!) I’ve added dried morello cherries, flaked almonds and almond extract for a delicious Bakewell-inspired version of this lovely dessert. Although the dried morello cherries can be reasonably expensive, PLEASE do not be tempted to use glacé cherries; they are not the same and have none of the sharp cherry flavour I want in this recipe. Sorry to be bossy, but it’s for your own good…! 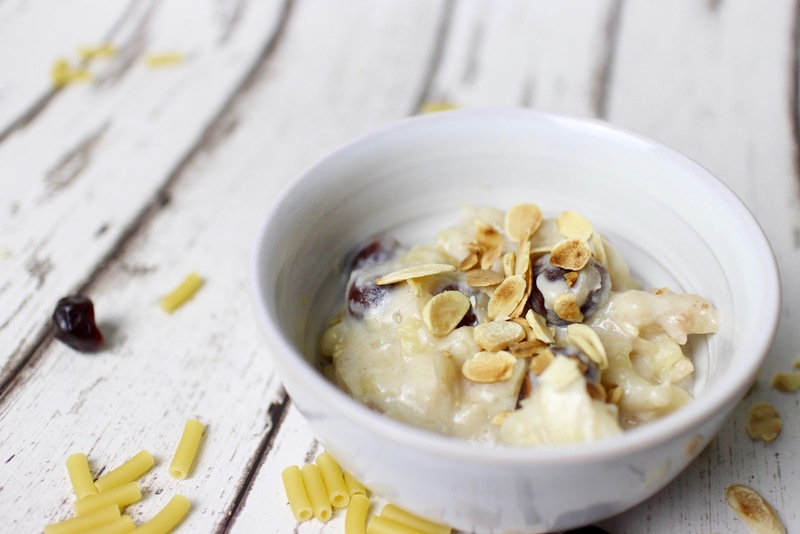 My mum’s traditional sweet macaroni pudding, with the added flavour of cherry and almond. 1. Place all the ingredients into the pot of a slow cooker. You may need to warm the milk first as some slow cookers need to start with hot liquid; check the manual for yours if you’re not sure. 2. Cook on low for around 3 hours, stirring every now and then to stop the pasta from sticking. 3. When cooked, enjoy sprinkled with some optional toasted almonds. Why not join in with Crocktober on Twitter? If you tweet, please use the hashtag #Crocktober. wow kevin this is so different! i wonder how your mum first thought of a sweet macaroni! ill try it if I'm brave enough! Wow – what a fantastic and unusual idea! Amazing! Sweet macaroni? Wow – that isn't something that I have heard of before, but I would love to try it. I think my husband would love it too. Sweet macaroni – that takes me back! And bakewell variety – genius idea!! My mum used to make sweet macaroni – this sounds lovely, I do adore bakewell flavours too. Ok I must be really showing my age now, but is this not made as a pudding now? Don't tell me people don't eat rice pudding either? !